Jason Byrne scored twice as Shelbourne beat Glentoran 2-1 in their all-Ireland Champions League showdown at The Oval tonight. The eircom League's leading scorer for the last two seasons took his tally to 11 for the current campaign with a 10-minute double to seemingly leave their Belfast opponents on the ropes in this first-round qualifier first leg. But Glentoran will head to Tolka Park next Wednesday for the return with hope, courtesy of a lifeline strike from Sean Ward, ensuring Shelbourne will not have it all their own way. Shelbourne started the game brightly and passed the ball around well. On three minutes a David Crawley ball found Richie Baker far out on the right wind but the ball bounced into touch before Baker could do anything. But it was not until the ninth minute that the first chance materialised, with Shelbourne's Wesley Hoolahan weaving his way between two defenders before playing in Jason Byrne for an angled drive which goalkeeper Elliott Morris had covered. The visitors continued to look the more imaginative side and, in the 15th minute, an incisive ball through the middle from David Crawley was poorly cleared by Glens captain Paul Leeman. Although the ball broke for striker Glen Crowe, his attempted lob over Morris lacked height and the ball was comfortably gathered. The home side were relying on long balls pumped into the Shelbourne area to create an opening, and one almost materialised when Kevin Keegan's delivery was taken off the head of the arriving Joe Tolan. But Shelbourne then took control and will wonder how they failed to take the lead before the break as they swept forward and created numerous chances. From the first corner of the match in the 27th minute, Glentoran again failed to clear adequately, this time Crawley's inswinger falling to Stuart Byrne who unleashed a stinging shot that was superbly saved by Morris. Three minutes later, Baker danced his way between Steve Parkhouse and Colin Nixon before delivering a low, left-foot curler which was bound for the bottom corner but for another fine intervention from the full-stretch Morris. 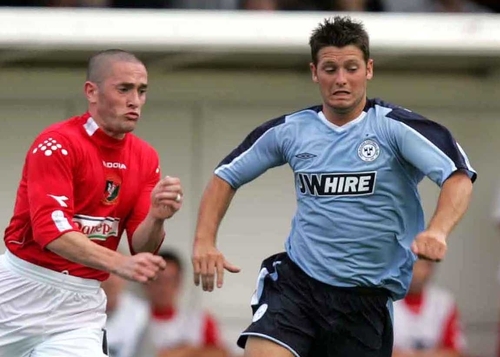 With Shelbourne clearly on top, Glentoran were fortunate not to be reduced to 10 men on the half-hour when it appeared as though Stephen Parkhouse had elbowed Hawkins on the edge of the area. Greek referee Georgias Kaznaferis only brandished yellow and from the free-kick, Jason Byrne's shot was deflected wide. A cynical challenge from Tom McCallion on Crawley moments later led to a second home caution, following which Shelbourne soon won their sixth corner in eight minutes, with Baker heading narrowly over the bar. McCallion was then on the receiving end eight minutes before the break, although Stuart Byrne could consider himself unfortunate to be booked as Kaznaferis was harsh with his decision. Shelbourne continued to press at the start of the second half, and they perhaps thought it was not going to be their night when they spurned two more chances in the 54th minute. From a corner from Alan Moore, on as a substitute just before the break for the injured Crawley, an awaiting Baker at the far post forced Morris into a tip-away save. But Shelbourne seized on the loose ball, with Owen Heary feeding Crowe for a seemingly simple chance from eight yards, only for the striker to curl his effort wide. Shelbourne's reward, though, was not long in coming, with Crowe making amends by teeing up Jason Byrne within seconds. With the Glentoran defence now stretched to breaking point, the eircom League's top scorer for the last two seasons sidefooted home his 10th of the campaign. The duo were then involved in Shelbourne's second in the 65th minute, when Crowe was brought down inside the area by Leeman - who was subsequently booked - allowing Jason Byrne to sweetly drive home from the spot. Sensing the tie running away from his side, Glens boss Roy Coyle made two changes soon after, with Michael Halliday and Chris Morgan replacing Tolan and Parkhouse. But then 12 minutes from time, with their first shot on target, Glentoran gave themselves a lifeline courtesy of a low 20-yard drive from Sean Ward. They almost made it 2-2 when Ward again fired goalwards, only to be denied by a combination of Stuart Byrne and Baker. Afterwards, Shelbourne manager Pat Fenlon told RTÉ Sport: "We've kept it alive, it was a good performance. It was disappointing to concede a goal because we dominated the game from start to finish. We could have scored a couple more but to come here and win, I'm very pleased." "We kept the ball, we passed it and we created chances but the gloss was taken off it by concededing the goal." Double goal hero Jason Byrne said: "It was a very tough game but myself and Glen worked well up front and we were knackered coming off at the end, we gave it our all." Glentoran manager Roy Coyle believes his side are still in with a fighting chance, particularly after the way his players finished the stronger against a team currently midway through their league campaign. In contrast, Glentoran have only just started pre-season and Coyle said: "The thing which pleased me is the way we got stronger and stronger as the game went on. At the beginning of the tie Shelbourne were much sharper and that is due to them playing competitive football, while we looked a bit heavy-legged." He added: "But at the end of the game we maybe could have had another goal. We've got the one and this game is still on and we have given ourselves a chance, a bit of hope and you have to think they might be a bit edgy now. You have to remember it only takes a second to score a goal in this game and psychologically the fact we got that goal late on will help us." Glentoran: Morris, Walker, Nixon, Leeman, McCallion, Ward, Lockhart, Parkhouse (Morgan 67), Holmes, Tolan (Halliday 67), Keegan. Shelbourne: Delaney, Heary, Crawley (Moore 43), Hawkins, Rogers, Cahill, S Byrne, Hoolahan, Baker, J Byrne (Crawford 80), Crowe (Fitzpatrick 75).